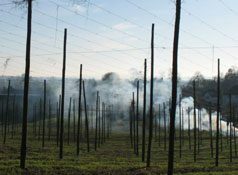 Our hop gardens extend to 24 acres and are situated on the southern slops of the Hogs Back where they form the back drop to the picturesque village of Puttenham. The hops are grown on a narrow band of gault clay which lies between the chalk and the sand deposits, and this unique British hop terroir is a perfect location for hop production. Hop plants are perennial and grow back from the root stock every year. 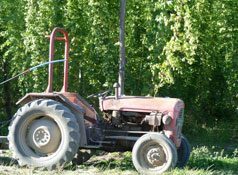 Some of our plants are over 30 years old, but are still producing great quality hops. The growing season starts in April when the hop plants start to shoot and small purple buds emerge. 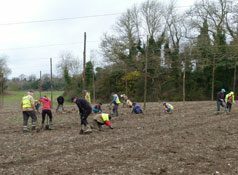 The hop garden comprises hop poles and wirework which form a framework around the plants. In February and March each hop plant is given four strings hooked from the top of the wire and the shoots begin to grow up the strings. 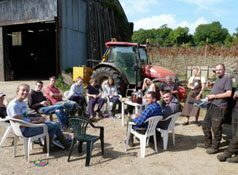 By May they need a hand and they are individually trained to ensure that only the best shoots are used and that they are heading in the right direction. This is a labour intensive occupation! 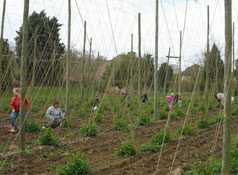 The hops will grow to a final height of 16 feet by the middle of June when they will have reached the top hooking wire. During this accelerated growing season we must control mildew, mould, red spider and aphids to ensure a high quality crop. The hop plants will then start to produce “laterals” which grow out and from which first will come burr, then cone or flower. The plant will be approximately three weeks in burr then three weeks in flower and we can then harvest as and when we feel that the crop is mature. Our hops are harvested with the help of student labour in early September. Each hop string or bine is cut down and taken to our static hop picking machine which strips the hop flower from the bine, laterals, string and leaf. 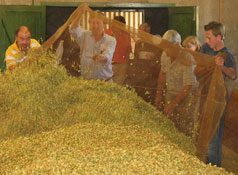 The hops are then dried in the kilns in our oast house where the drying process is as important as the growing and the picking. Hops contain over 80% water when picked and in order to preserve and store them we reduce this to below 10% moisture. Heat is provided by gas powered burners and the hops normally dry for about 8 hours. 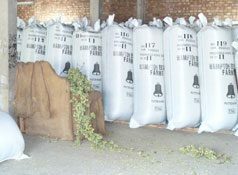 The hops are then pressed into bales of between 70 – 80 kgs. Each bale bears the emblem of a church bell, signifying hops grown in the Farnham area. The bales are stored on farm until they are despatched to our brewer customers. Currently we are delighted to supply The Hogs Back Brewery, Harvey’s of Lewes and The Black Sheep Brewery in Masham Yorkshire.